Published: March 4, 2014 at 12:57 p.m. Updated: May 21, 2015 at 03:45 p.m. It should be simple enough to select Green Bay's all-time team, right? I mean, they've only won 13 titles (including four of the Super Bowl variety) and been in existence for nearly 100 years ... Easy peasy. Or not. With a franchise so rich in history, this is one difficult task. In fact, the most famous Packer ever -- socially, anyways -- didn't make the cut. Neither did a couple of the most productive, due to immense strength at their respective positions. Of course, there is sure to be some dissent, especially on this project. Hit me up to share your thoughts: @HarrisonNFL is the place. If Aaron Rodgers has another season like he had in 2014, we might have to revisit this, but for now, Starr has to be the choice here. He went 9-1 in the postseason and ultimately had the Packers on top five times, leading them to capture the pre-Super Bowl-era NFL Championship in 1961, 1962 and 1965, then directing them to victory in Super Bowls I and II. His legacy is that of a winner. When he retired, Taylor was the NFL's second all-time leading rusher, topping 8,000 rushing yards and 90 touchdowns. He set a Packers record and led the league by rushing for 1,474 yards in 1962 -- the only year anyone ever beat out Jim Brown. Hinkle beats out Ahman Green and Tony Canadeo, as we are putting a true fullback on the squad. The Packers have almost always employed a fullback. Hinkle was the best, winning two NFL Championships while being in the second group of players enshrined in the Pro Football Hall of Fame. Perhaps the greatest wide receiver in NFL history prior to Jerry Rice, Hutson retired in 1945 as the NFL's all-time leader in receptions, yards and touchdowns. Though Hutson played in a run-much, pass-little era, his career receiving touchdown mark stood for 44 years, until Steve Largent passed him up. Lofton beats out Sterling Sharpe on our list because he played longer, and because he was arguably the top wide receiver in the game in the early 1980s. Lofton topped 1,000 yards receiving five times in his Packer career -- and he would have done it six times if not for the players' strike in 1982. Though Coffman was one of the better players of the 1980s, a lot of people, frankly, don't know who the heck he is. The three-time Pro Bowler didn't always put up massive numbers, but he was very reliable. He averaged 15 yards per catch and scored 11 touchdowns in 1983. A member of the NFL's all-time team as selected by the Pro Football Hall of Fame in 1994, Gregg was a Lombardi Packer who won five titles while being one of the top players to ever play his position. Even Deacon Jones said he was the best. A charter member of the Pro Football Hall of Fame in 1963, Hubbard (pictured above on the right) was a dominant force on the 1930s Packers, playing both ways while being one of the first notable names, especially among linemen, of the "rag days" of pro football. Like Hubbard, Michalske was a top player of the 1930s, helping to make the Packers a threat to win the league title nearly every year. In fact, in 1931, Green Bay became the NFL's first team to three-peat, with Michalske being named All-Pro each year (earning a total of five selections over the course of his career). Picking between Kramer, Fuzzy Thurston and 1970s stud Gale Gillingham was not easy, as all were standout players. Ultimately, Kramer gets the nod, considering his five first-team All-Pro selections -- and the fact that he threw the most famous block in NFL history. Although Vince Lombardi traded him to the Eagles before the 1964 season, Ringo was considered the finest offensive lineman on the early Lombardi Packers, part of the championship teams of 1961 and 1962. Ringo was named to 10 Pro Bowls and is enshrined in the Hall of Fame. Perhaps the greatest defensive lineman in NFL history, White was dominant as a Packer, even though he was in his 30s for all six of the seasons he spent in Green Bay. White's move from the Eagles to the Packers would go down as the first major signing in the annals of free agency, and it paid off for Green Bay in the form of 68.5 sacks and legendary play. A member of the Pro Football Hall of Fame's All-Decade Team of the 1960s, Davis was a consistent performer who has, at times, gotten lost in the shuffle among the Deacon Joneses and Bob Lillys of that era. Davis made five straight Pro Bowls. 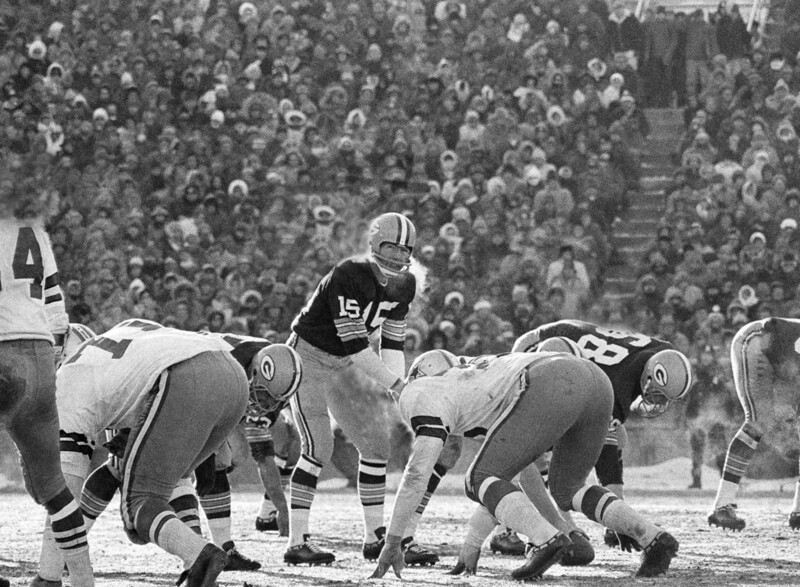 Coupled with Hall of Fame linebacker Ray Nitschke, Jordan made it nearly impossible to gain any kind of ground yardage against the Packers, especially through the middle. Jordan was named first team All-Pro five straight times, from 1960 to 1964.
Who doesn't remember big Gilbert? The dude played at around 350 pounds, but don't let that fool you ... Brown could play. He was an immovable object, anchoring the interior of the Packers' line over 10 years and participating in 13 playoff games. Robinson finally made the Hall of Fame in 2013 after waiting more than 30 years. He also authored the finest defensive play in Packers lore, instinctively rushing the Cowboys' Don Meredith to force an interception that clinched a win in the 1966 NFL Championship Game. Matthews finally completed his first full season as a starter in 2014 -- his sixth year in the NFL. He's compiled 61 sacks in that span despite dealing with myriad injuries for the bulk of his career. He returned to the Pro Bowl for the fifth time in 2014 after missing out in 2013. Nitschke embodied what the Packers of the 1960s -- and the old NFC Central -- were all about, playing a tough brand of football. A hard-nosed competitor who won five titles with the team, Nitschke is enshrined in the Hall of Fame and has his number retired in Green Bay. The premier cover corner of the 1960s, Adderley was a rare breed -- a defender who was as elite athletically as the players on offense. He scored nine return touchdowns and twice led the NFL in interception return yards before landing in the Hall of Fame. Woodson was as dynamic a corner as has ever played. He had Rod Woodson-esque athleticism, a Ronde Barber-esque ability to blitz and a Deion Sanders-esque knack for scoring. An eight-time Pro Bowler, Woodson was the Defensive Player of the Year in 2009. He might not be the greatest safety to ever play, but as Bum Phillips once said, "It wouldn't take long to call roll." Wood made eight Pro Bowls, becoming one of Lombardi's top players by his second season. During a 12-year span in Green Bay, Wood didn't miss a single game. When you think of the Mike Holmgren Packer teams, it's hard not to see images of Butler making plays or stirring it up with the fans. He created the "Lambeau Leap." A member of the 1990s All-Decade Team, Butler was named first-team All-Pro four times. The greatest kicker in Green Bay history played for the team relatively recently. From 1997 to 2005, Longwell was quite reliable in Titletown. Longwell led the NFL in extra points as a rookie and is the only Packer player to have scored more than 1,000 points thus far. Hentrich only punted in Green Bay from 1994 to 1997, but in that time, he averaged 42.8 yards per punt. One of the top punters in the 1990s, Hentrich even doubled as a kicker in 1995 when Chris Jacke couldn't go. Williams is a Lombardi-era Packer who did not make the Hall of Fame and who actually only played for the club from 1967 to 1970. However, two marks that he set in 1967 -- 41.1 yards per kick return and four return touchdowns on kickoffs -- still stand as single-season records 47 years later.